All Oceanic Infrared Saunas are manufactured in our own UK factory using traditional kiln dried Grade A Unsorted Scandinavian spruce from managed and replanted forests. All models are designed for permanent installation with fully screwed joints. Our domestic models are available in 3 levels of specification including our unique “Infrared Saunarium” combined sauna and steam. The Oceanic IR1020 1250 x 730 x H1950mm (900Watts) infrared sauna is supplied complete with 3 x 300 watt Oceanic infrared heaters with digital controls having a countdown timer for settings up to 60 minutes, a thermostatic temperature control to set upto 60°C and a high temperature safety cut off at 80°C to prevent overheating. Stereo Speakers with bluetooth or audio connection lead to connect to compatible MP3 or smart phone devices, our brand new modern full height safety glass sauna door with clear glass, polished chrome & Ash wood handle and polished chrome hinges. Slatted wooden benches, backrest, and floor mat (deluxe models only), lighting, all fittings and fixing, assembly manuals and user instructions. 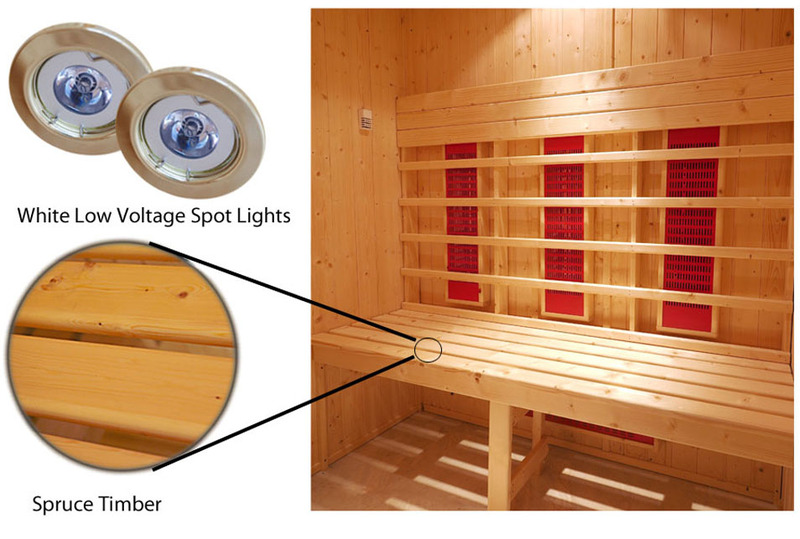 All infrared sauna panels are fully insulated with 50mm of rockwool fibre, and are clad on both the exterior and interior faces allowing the sauna to be assembled free standing in almost any location without the need for brickwork, plastering or fixing to walls . The door mounted in its frame is the same size as a panel and entirely symmetrical allowing its position on the to be readily interchanged, though the door must for safety reasons be opened outward it can be hinged either left or right. For those seeking extra style and comfort, our Deluxe specification offers an upgrade to Abachi timber for the benches, backrests, floor mat and heater guard. Abachi timber is knot free hardwood with an attractive appearance, it is selected for use in saunas due to its low thermal conductivity. 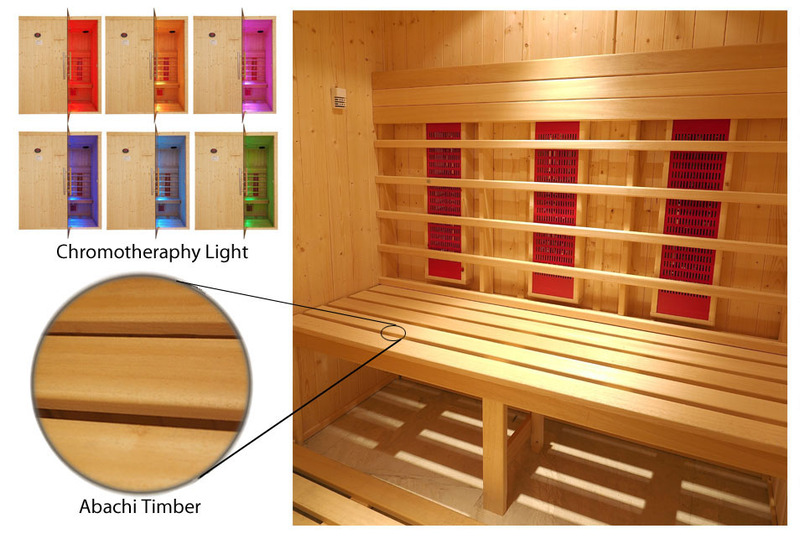 All deluxe infrared sauna are additionally supplied with a slatted floor mat. The lighting provided is low voltage spot lights and colour changing chromotheraphy lights.